October was National Physical Therapy Month and St. Peter’s Health Partners recognized the occasion with celebrations at its various outpatient physical rehabilitation sites throughout the Capital Region. One of the most creative celebrations was at Seton Health Rehabilitation – Clifton Park, located at 648 Plank Road, Suite 101 in Clifton Park. 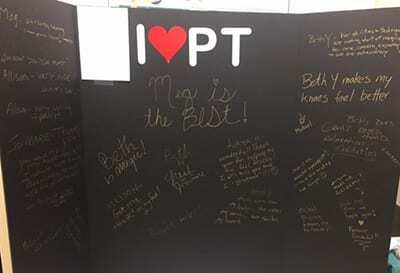 The staff there decorated for the Halloween season, integrating tri-fold poster boards into their festive displays, which allowed patients to write messages of support and thanks to their physical therapists. 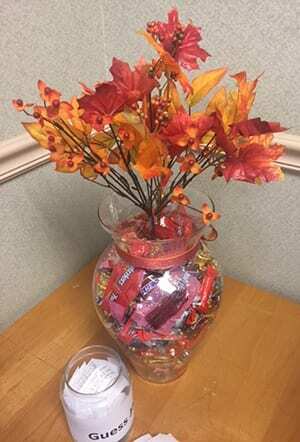 They also set out a candy jar arrangement filled with 299 pieces of candy, and encouraged patients to guess the number of pieces of candy throughout the month. Ten-year-old patient Abigail Stopyak was elated when her guess of 300 pieces of candy won her the entire jar. Happy Halloween and Happy National Physical Therapy Month to Abigail! National Physical Therapy Month was established in 1981 by the American Physical Therapy Association (APTA) to recognize the physical therapy profession’s efforts to “transform society by optimizing movement to improve the human experience.” Throughout the month, physical therapists and PT clinics engage their communities in activities to promote healthy lifestyles and to raise awareness of the importance of PT. Whether it’s a minor sports injury, post-surgery, neurological condition or you are a cancer survivor, St. Peter’s Health Partners can help you achieve your highest level of mobility and strength through physical therapy. We offer a full continuum of rehabilitative services. Inpatient services are offered at all four of our acute care hospital locations, as well as our nationally recognized, Sunnyview Rehabilitation Hospital. For your convenience, outpatient services are offered at a variety of locations throughout the Capital Region.